I went Grebe hunting at University of York today and heard a great commotion in the water under the bridge. This is either 2 males fighting over a girl - not shown in this picture - or a girl attempting to fend off an over attentive bloke who is egged on by his pal! At times I feared for the life of the bird held under water but eventually the 3 swam away quite amicably. Great shot, Jesika, these do have some big battles. Last year I spent about twenty minutes watching and photographing two pairs that were all getting involved in the fight. @markp Thank you, Mark. I enjoyed my trek around Campus West today, chasing a young Grebe. These battling birdies were an unexpected bonus, several minutes of fighting until they called a truce. Fortunately none of the birds seemed to be hurt. Wow, great action shot. Very interesting birds too. @joev Thank you, Joe. 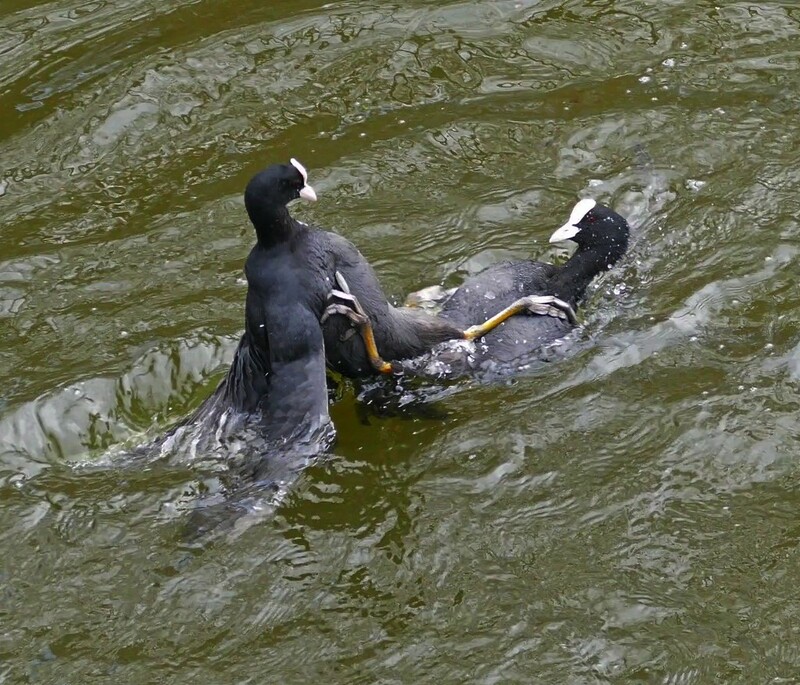 I'd never seen Coots fighting like this before, minor "Go away" squabbles but not a potentially damaging battle. @cheekylulu Thanks, Louise. I've never seen them fighting before, chasing away often but this seemed to be all out war! @gaylewood Thank you, Gayle. I was photographing a young Grebe when I heard the commotion at the other side of the bridge. 2 birds fighting, the third keeping just out of contact, but watching very carefully. @oldjosh Lovely feet, aren't they? Good job they don't need shoes! This is the first fight I've ever seen, don't think any damage was done other perhaps to pride.